BEIJING, China, May 4, 2012 (ENS) – The United States and China have agreed to jointly develop low carbon strategies, and conduct joint research on smart grids, intelligent vehicles, and electric vehicles and conserve large rivers under five new EcoPartnerships signed Thursday in Beijing. In addition, Chinese State Councilor Dai Bingguo announced that China has joined the Global Alliance for Clean Cookstoves during a tour of a clean cookstove exhibit with U.S. Secretary of State Hillary Clinton, who is in Beijing on a diplomatic visit. Clinton launched the clean cookstoves initiative in 2010 to reduce the health and environmental risks of polluting cookstoves fueled with wood or dung. “So if you combine the good news that Councilor Dai [Bingguo] gave me that China is joining the Global Alliance for Clean Cookstoves with the EcoPartnerships, I think once again our cooperation is really paying dividends for the people of both our countries and the world,” Clinton said. 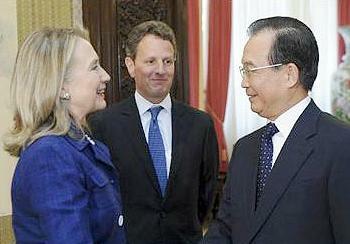 “This illustrates once again that the United States and China can and will work together in new ways and through many channels to address our common challenges on energy and the environment, two issues that transcend politics that we live with every single day in our homes, our businesses, and our communities,” said Clinton. The EcoPartnerships Framework is aimed at developing new models of mutually beneficial voluntary activities between state, local, and private sector organizations to spur innovation, investment, and engagement on clean energy and environmental issues, including climate change, according to the U.S. State Department. U.S. Special Envoy for Climate Change Todd Stern and China’s National Development and Reform Commission Vice Chairman Xie Zhenhua co-chaired the event. City of Portland – City of Kunming: This EcoPartnership will leverage the clean technology expertise of Portland, one of America’s greenest cities, to develop low carbon strategies for the city of Kunming as it develops, implements, and evaluates its own low carbon programs. This partnership will result in measurable and verifiable reductions of the greenhouse gas carbon dioxide (CO2) and quality of life improvements in Chinese cities. This partnership will involve training programs and exchanges via Portland’s “We Build Green Cities” program. University of California, Los Angeles – Peking University: This EcoPartnership will enlist a consortium of clean energy and climate change leaders from American and Chinese universities, think tanks, and the private sector to conduct joint research on smart grids, intelligent vehicles, and electric vehicles. UCLA and Peking University are spearheading the partnership, along with the China National Climate Change Strategy Research and International Cooperation Center. The consortium is building a joint research laboratory on smart grid technology at Peking University that will serve as a hub for researchers and students, particularly from the U.S. and will enable them to better understand China’s energy development environment. The consortium may also facilitate economic growth and clean job creation in the U.S. by introducing Chinese clean tech companies to manufacturing opportunities in the United States. International City/County Management Association (ICMA) – China University of Political Science and Law (CUPL): This EcoPartnership will support training on good governance and environmental sustainability at the local government level. Besides offering learning tours, this partnership will encourage a Local Government Exchange Job Shadow Program and Professional Development and Lecture Tours to China, where American local government officials will gain insight into how China is addressing urbanization and associated environmental issues. City of Columbus, Ohio – City of Hefei, Anhui: These sister cities will form an EcoPartnership together with flagship universities in those cities. This EcoPartnership plans to use the resources from Ohio State University’s Center for Automotive Research and Hefei University of Technology to develop and apply electric vehicle technologies and address other energy and environmental issues facing both cities, such as lake and wetland conservation, waste and sewage treatment, energy conservation in buildings, and urban planning. This EcoPartnership was accepted into the program in February during Vice President Xi Jinping’s visit to the United States. The Nature Conservancy’s Great River Partnership – The Chinese Ministry of Agriculture’s Yangtze River Fishery Administration: This EcoPartnership will work to advance river basin management and conservation of large river systems and will try to develop new capacity for sustainable agriculture in both countries. This EcoPartnership will use each partner’s unique strengths to develop new systems to monitor and manage large river systems such as the Mississippi and Yangtze Rivers. This EcoPartnership also was accepted into the program in February during Vice President Xi Jinping’s visit to the United States. 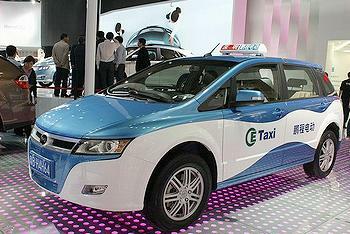 Eighteen partnerships have now been agreed since the U.S.-China EcoPartnership program began in 2008. The Global Alliance for Clean Cookstoves is a public-private partnership that seeks to save lives, improve livelihoods, empower women, and combat climate change by creating a thriving global market for clean and efficient household cooking solutions. By joining the Alliance, China will help meet the Alliance’s goal to ensure 100 million homes adopt clean and efficient stoves and fuels by 2020. In China, about 80 percent of households rely on solid fuels like wood or dung to meet their energy needs. According to World Health Organization estimates, this exposure accounts for more than 540,000 premature deaths in China each year, and significant chronic and acute illnesses. 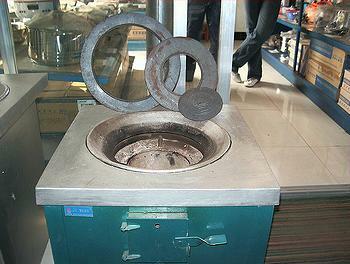 China’s domestic cookstove industry is one of the world’s largest with over 100 manufacturers. As part of the Alliance, China will support efforts to establish global performance standards for cookstoves and work with domestic manufacturers to meet these standards. Through the Alliance, China will support research and development to accelerate advancements around technology, agriculture and fuels, health and climate, as well as efforts to bring clean cooking solutions to homes in China. China intends to develop an international cookstoves research center to adapt high-performing domestic stoves for global markets. To date, more than 300 public and private partners and 35 countries have joined the Global Alliance for Clean Cookstoves by making commitments to overcome market barriers and achieve large-scale production, deployment, and adoption of clean stoves and fuels in the developing world.